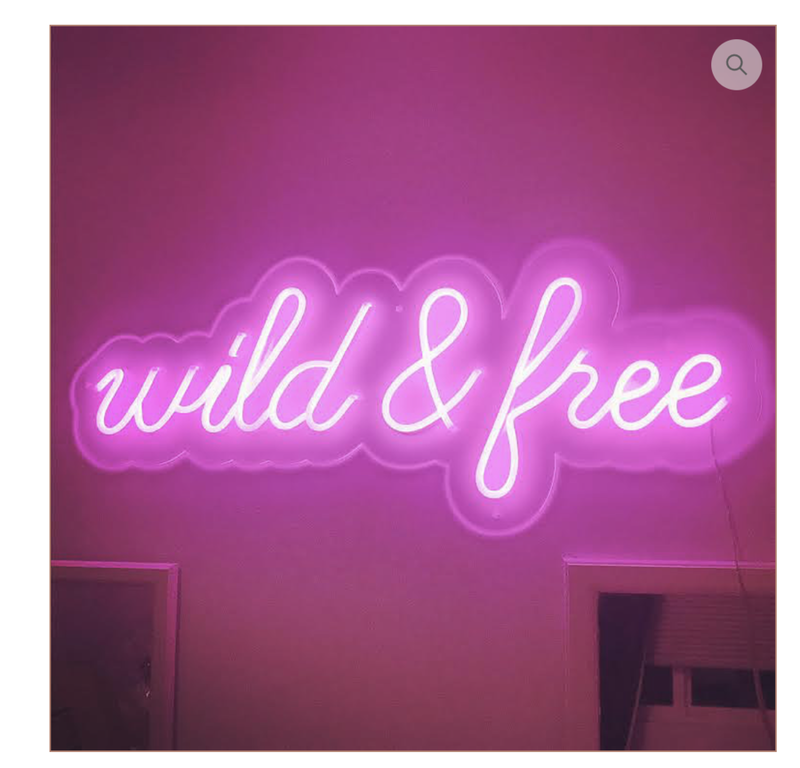 You're scrolling through instagram and see this super cute "neon" sign that would look AMAZING above your couch and immediately buy it. Or, maybe you notice something and visit the website to see it looks different than most neon signs you've seen. Perhaps you're sold by the price and just go ahead and buy it at this point. Or maybe you're one that does a bit more research on the company's "about" section. You learn that their product is what they call "New Neon™ " or "LED Neon". They go on to explain that their product is a neon alternative, a safer more eco-friendly version of neon - it's "70% - 80% MORE efficient!" They inform you that neon contains harmful gases. This information, plus the price sounds like a win-win, doesn't it? The only problem is that this information is, at best, exaggerated. Mostly, it's untrue. This is a continuation of my discussion on neon in our world today. 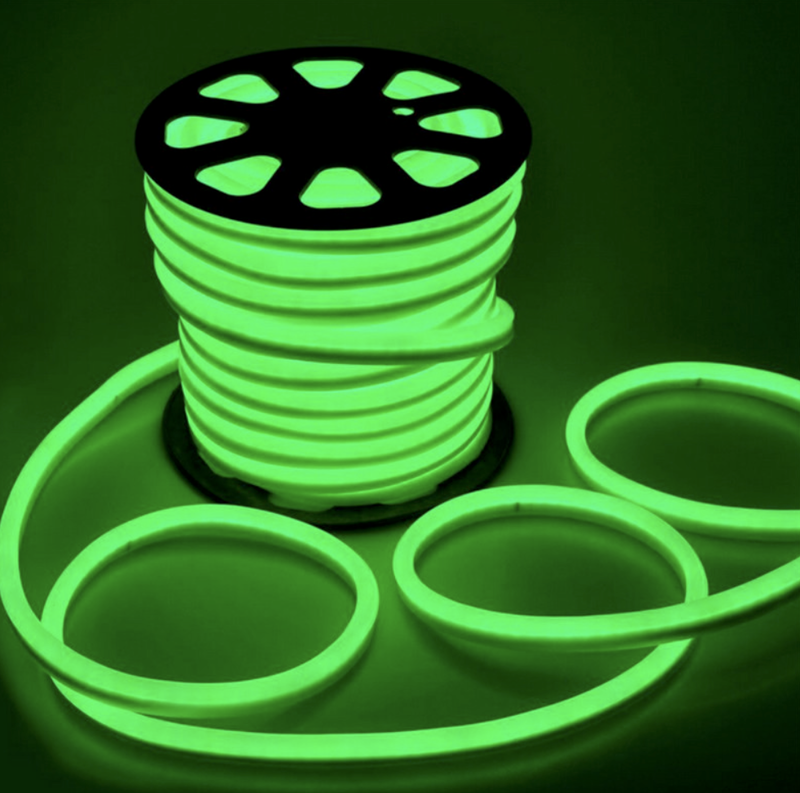 Neon tubes have been a part of our world for 108 years. I began my neon journey just before its 100th year. I decided I wanted to discuss the strange changes our industry/artform has gone through since I've been able to witness. The information I have to share is gathered from many conversations with benders that have decades of experience on me. Collectively, these benders have hundreds of years of sign industry experience, including vast knowledge of LED's. Most relevant is their witness to the introduction of LED's and the near devastating affect it had on neon. In my first post, I discussed the ongoing issues of copyright infringement neon artists and artists working in neon experience. As well, I briefly touched on the topic of the fast growing number of middle-man businesses that supply custom neon (hire a bender to make it for them) to consumers to take advantage of the trend. Some of these companies will offer a real neon sign. Another brand of these businesses is the neon alternative, or "LED NEON". How you can tell it's LED and not glass - the cursive feels stiff, the ends are very blunt and color fades in that area, there's nothing connecting the words, it needs a bulky plastic backing (in other words, you cannot install directly to the wall). Let's get one thing out of the way. Neon is a gas and a neon sign is made of glass. LED is LED. You may be thinking, "duh". Well, it may surprise you that there are some people who don't know the difference. Using the word "neon" in their product name obviously helps to sell the product because really, people are looking for neon. There are a variety of methods that different companies use to create their product. Some of them probably have patents on their particular method or material. Some are DIY, making their signs from a product called Flex. Some outsource manufacturing overseas. What these companies have in common is that they promote their product as being superior in its carbon footprint and its safety as compared to neon, the same way they did the first time around. What's different this time is that there are studies that say they are wrong. Many of these companies include "about" sections on their website. 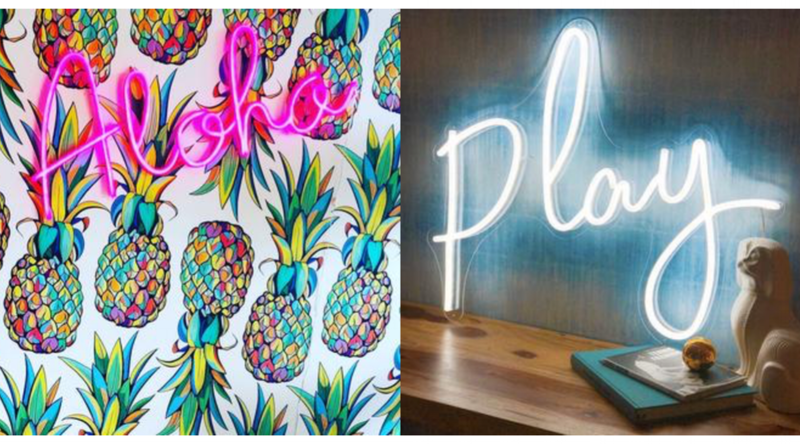 They describe their love of neon and the discovery of a gap in the market for a more eco-friendly alternative. First of all, there's hardly a gap. Neon alternatives have been around for a while, as I mentioned before. These new renditions are different in the sense that they depart from the sign market and into the designer market. Secondly, the debate about how much more efficient LED is than neon and how consistent that is across all applications, is still an enormously debated topic. These new boutique online companies tell you in their descriptions that they are 70%-80% more efficient than neon. Hmmmmmm? Let's look at this. Yes, LED is more efficient than incandescent bulbs. However, the facts are that when LED's are tested to neon, LED'S are either less efficient or the same. Any neon sign uses what we call a "transformer" to light it. The most amperage these power sources draw is 3.7amps for some of the largest transformers. The amperage used to power the neon is under 1 amp. That's pretty dang efficient. I've never heard anyone talking about breaking the bank powering their neon sign for a small business or home. In fact UL Laboratory, the most well known and respected safety testing lab in the United States, has established its own equivalent rating system named "UL Energy Verified Program". After much testing, UL has awarded NEON it's "Green Energy Verified". Here is a comparison between Neon and LED from an unbiased source. This comparison takes efficiency, longevity, maintenance and brightness into account and gives a star rating to each. It's definitely worth a read if considering between the two for your business or home. The consistency of this efficiency depends highly on the application. It's such a small amount of difference in efficiency in most cases, especially in the case of these small little signs. One company even says, "To put it in better perspective, glass neon uses 15,000 volts while LED lights use only 24 volts." This information is so misinformed. Yes, while some of the super large neon installations require 15,000 volts to light the neon, they still only draw 3.7amps from the wall. The size of the product they are selling is equivalent to a neon powered by a 8kv -10kv transformer, drawing up to 1.2amps from the wall. Again, very efficient. The other claim businesses make is that neon isn't safe, even hazardous. What's more, they prove their lack of knowledge by saying the gases are harmful. All gases used in the production of neon are the noble, inert gases. They are in the atmosphere already, we breathe them. They are non-reactive, non-toxic, and perfectly safe. Yes, some neon contains small amounts of mercury which is smaller than the size of a pea. When you compare the amount of carcinogenic toxins in LED, I'd say LED is more harmful than neon. Here is a link to an online scientific publication that give you the run down on the numerous toxins in LEDs. They found that low-intensity red lights contained up to eight times the amount of lead allowed under California law, but in general, high-intensity, brighter bulbs had more contaminants than lower ones. White bulbs had the least lead, but contained high amounts of nickel. I get it, not everyone has the money to spend on a neon sign from an artist or bender. Wait, but scrolling through these prices I'm seeing that the cost comparison for some of the products I saw aren't THAT drastic, especially for something that will last longer and can be maintained. Yes, you can get a super small work for maybe $50 dollars but wouldn't you want to spend more on something that will last longer and can be maintained? Some of these products are up to $400. You can definitely get a small neon for $400 from some benders. If you're just looking for a kitsch thing for your home that you don't intend to take along on the rest of your life's journey, then spend $50 on a cheap product and when it dies or you move just throw it away, right? It's eco-friendly? Well, it's not classified as toxic and are deposited in regular landfills, but with all of these toxins they should absolutely be considered hazardous waste according to scientists. Plus - plastic, plastic, plastic. I'll make one last small argument here. If you are the type of person that likes to support local businesses, you should consider supporting a local bender. Some of these companies manufacture their product overseas. If you see a real neon sign from a lifestyle brand selling for $80, chances are they aren't covering manufacturing costs in America at that price point. Listen, I'm not trying to dissuade people from buying these products. What I am doing is encouraging people to not believe everything they read. I would also like to urge these business that are inspired by neon to do more research into the claims they make. I'm sure they would have no problem selling their product without making the erroneous comparisons. At the end of the day, the comparisons across all characteristics are so minor. There is so much back and forth about this topic. 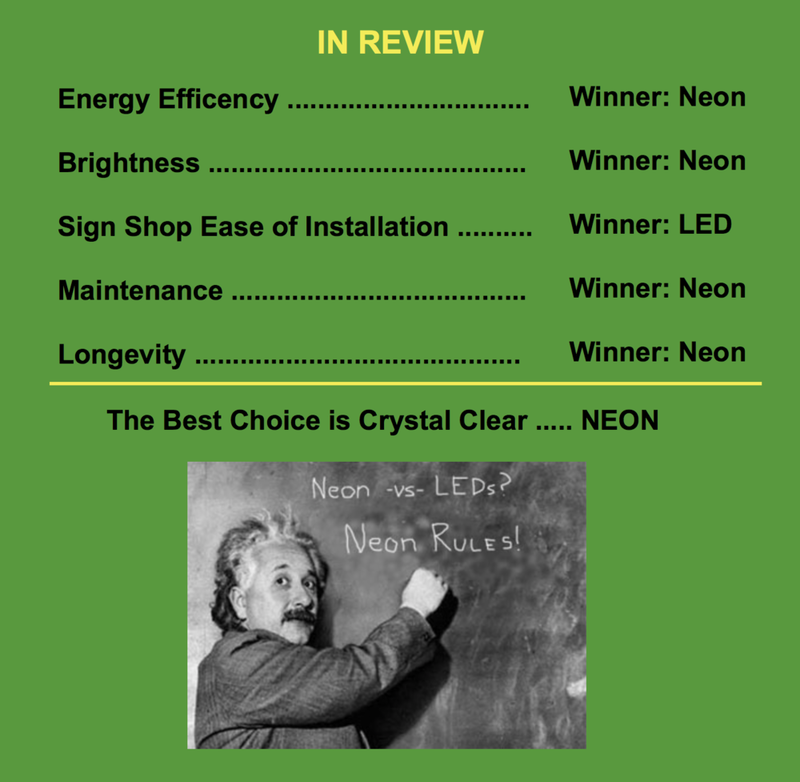 Neon is just as good as LED and certainly not less efficient, eco-friendly or safe. In many ways, I am very happy that the look of neon has been so desirable for so many people. Yes, it's good for my industry that there is desire and popularity there. What's not good for the industry is when companies offer misinformation about the way neon works to try and sell their product. As I've mentioned, LED alternatives nearly devastated the neon industry before I began my journey and most of it was due to these "better than" arguments. This set back is still palpable today. Many people don't know much about neon so it's easy for the claims to be made without anyone questioning it. It is your choice which product you go with. I think consumers have a right to know all sides of the argument because ultimately, I would hope that you'd want your choice to be a well informed one. As well, we should be mindful of the products and artifacts we produce on this Earth in our lifetime and strive for truth and authenticity, always.